The Saint John Bay hotel will not be able to reopen, even partially, the date originally scheduled for December 22. The Eden Rock makes appointments to its customers in November 2019. Large-scale work, technical problems, the difficulty of moving materials, and a shortage of craftsmen and workers: Eden Rock will not achieve its goal of reopening on December 22, 2018. The hotel devastated on September 6, 2017 by hurricane Irma hoped until then to be able to welcome customers in a partially open establishment, for the holidays of end of year, and to finalize the works in a second time, between June and December 2019. He had to give up, first, he says in a statement, because of problems of routing materials. “The damage in all the Caribbean is important. The ports are completely saturated (these same ports which are also still under construction) and do not allow normal operation, resulting in major delivery times, including for our own goods “, explains the establishment of the group Oetker Collection. As in any self-respecting project, Irma-related problems slowed the progress of the works one after the other, and in particular the difficulty of finding workers on the island. “It is with regret and heavy heart that we have made the decision that was imposed on us and that of staggering our reopening, including our two phases of work originally planned, and reopen brand new from November 2019,” says the release of Eden Rock, which states that the majority of customers have referred to the villas Eden Rock or other hotels on the island. 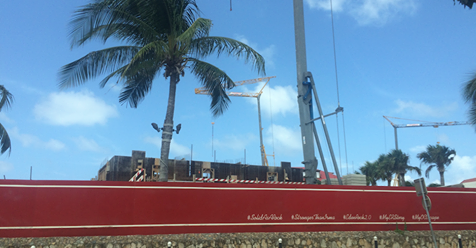 “With a new building stronger than ever, the new Eden Rock-St Barths will find all its superb, ready to face the most violent thunderstorms. Indeed, the hotel wanted to build more solid in case of new hurricane Irma. He notably dug inside the rock to install kitchens, protected behind a door designed for submarines.